A deftly plotted novel that combines strong characters, crackling prose and a compelling, lived-in authenticity. But what really sets Slugger apart is its ability to educate as well as entertain. Reading this book, we’re schooled not only in the law’s arcane intricacies but also the complex moral calculus that allows a defense attorney to serve his clients, presuming their innocence, while still being able to look himself in the mirror. Highly recommended. 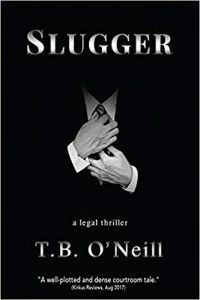 Tim O’Neill admits he has spent three decades practicing law. Trial work allowed him to fight the old battles youth (primarily against authority of any kind), and provided a treasure trove of material. “Courtroom work, if you do it right, is essentially story telling. Not just any story. It must ring true because In court emotions are tense, senses are acute. The result can be comic in its absurdity, or sad enough to make you weep.” He has taken his experience and created a powerful and timely book about powerless people and what causes them to finally rise in protest.